Add one level scoop to 6-12 oz of cold water or any beverage of your choice. Mix or shake until powder is completely dissolved. Drink, Enjoy. Repeat as desired. This product is for use by healthy adults only and not for use by anyone under age 18. DO NOT USE if you are pregnant or nursing. Consult a physician before using this or any dietary supplement or before starting any diet or exercise program. CONSULT A PHYSICIAN BEFORE USE if you have any medical condition or if you are taking any medication. DO NOT USE if you are allergic to milk or soy. IMMEDIATELY DISCONTINUE USE and call a physician if you experience any adverse reaction to this product. KEEP OUT OF REACH OF CHILDREN. Store in a cool, dry place away from sunlight, moisture, and heat. Always keep tightly sealed. Do not use if safety seal is broken, missing, or has been tampered with. Protein Blend (Whey Protein Isolate, Micellar Casein Protein, Instant Whey Protein Concentrate, [Whey Protein Concentrate, Soy Lecithin], Whey Protein Concentrate), Sunflower Oil Creamer, Natural & Artificial Flavors, Cellulose Gum, Sucralose, Xanthan Gum, Ace-K, Papain, Bromelain. Protein Blend (Whey Protein Isolate, Micellar Casein Protein, Instant Whey Protein Concentrate, [Whey Protein Concentrate, Soy Lecithin], Whey Protein Concentrate), Peanut Flour, Sunflower Oil Creamer, Natural & Artificial Flavors, Cellulose Gum, Calcium Silicate, Sucralose, Xanthan Gum, Ace-K, Papain, Bromelain. 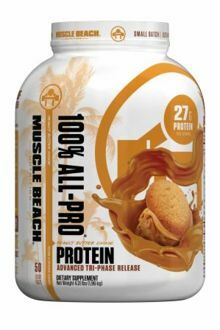 Muscle Beach 100% ALL-PRO is the great-tasting, premium-blended, tri-phase protein formulation that all elite Muscle Beach Athletes are raving about. 100% ALL-PRO does not contain any substance banned by the NCAA, IOC, WADA, or any mixed martial arts, bodybuilding, powerlifting, or weightlifting federation, or by the U.S. Armed Forces.